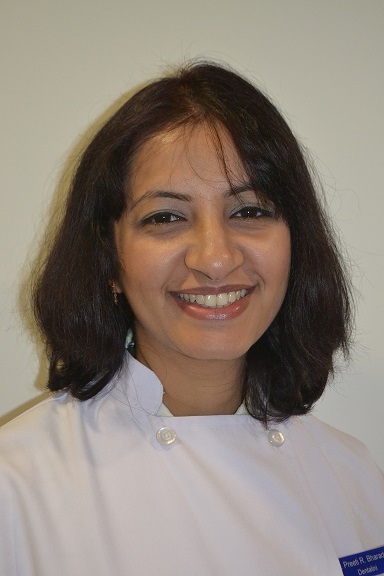 Dr Preeti Bharadwaj is the Principal Owner and Dental Surgeon of Dentalini, and is a registered member of the Australian Dental Association. She has extensive experience in treating a wide variety of dental procedures including cosmetic and paediatric treatments. Dr Bharadwaj trained in Dental Surgery at Rajiv Gandhi University in India, followed by a rotating internship that covered Maxillo Facial Surgery, Periodontics, Conservative Dentistry & Endodontics, Pedodontia, Orthodontics and Prosthodontics. Throughout this time Dr Bharadwaj undertook community work in various rural and impoverished areas of India, offering free dental treatment and oral health education to untouched areas; demonstrating her heart to help others. She has since worked with HCF, a leading private health insurance company and later with Dr. M Gantasala, a Prosthodontist, at Apex Dental Centre where she practised her skills in all areas of general dentistry with a keen interest towards pediatric and geriatric dentistry. She continues to push the envelope in general dental care because of her experience in a variety of procedures & treatments.